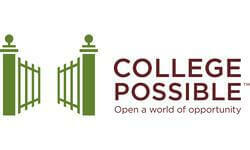 College Possible is a growing nonprofit dedicated to coaching low-income students to-and-through college, breaking the cycle of poverty and empowering our workforce. Our rigorously-tested model earns top-of-field results that have helped 98 percent of students served earn admission to college and supported nearly 80 percent through graduation. A 2011 Harvard study found that the program more than doubles a student's chance of enrolling in a four-year college. Through College Possible's work with low income students, 98% of our high school students gain admission to college. Through the service of our coaches, we increase the college graduation rate of our students to 4x their low income peers. Connect with students to work on key goals that will assist in student reaching the final goal of college graduation. Create new strategies for reaching students, develop relationships with students and help make college graduation possible. The College Possible program focuses on working specifically with low income students in our partner high schools and at the colleges they attend across our sites. Currently, our program operates in the Twin Cities, MN; Philadelphia, Pennsylvania; Milwaukee, Wisconsin; Portland, Oregon; Chicago, Illinois; and Omaha, Nebraska.